Figure A44. Izu-Bonin anomaly, interpreted as the Izu-Bonin slab, with (horizontal) [vertical] cross sections through (A)[D] the UUP07 p-wave) and (B)[D] the combined SL2013 and S40RTS s-wave models at 570 km; C) the location of the modern geological record that we interpret to have formed during the subduction of the slab. 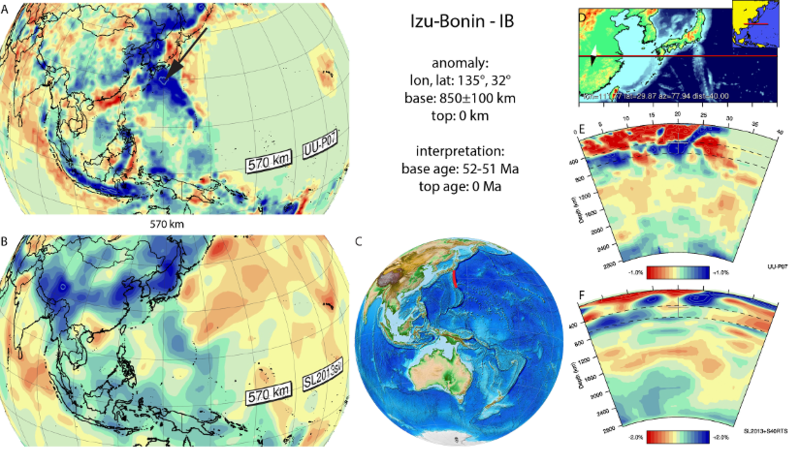 The Izu-Bonin anomaly (Figure A44) is interpreted to reflect Pacific lithosphere that subducted beneath the Philippine Sea Plate. It is well-imaged in seismic tomographic models of van der Hilst et al. (1991), Bijwaard et al. (1998), Gorbatov and Kennett (2003), Widiyantoro et al. (1999), Sugioka et al. (2010), Fukao and Obayashi (2013), and Jaxybulatov et al. (2013) and extends from the present-day Izu-Bonin-Mariana trench to the base of the upper mantle, where it is horizontally overlying the 660 km discontinuity. The Izu-Bonin slab is connected to the Mariana slab in the upper 300-400 km of the mantle, but is disconnected through a vertical slab tear at greater depth, allowing for the Mariana slab to penetrate steeply into the lower mantle (Miller et al., 2004; 2005). Previous reconstructions estimated subduction of the Mariana-Izu Bonin subduction zone to have started at 48 Ma (Seno & Maruyama, 1984) to 50 Ma (Wu et al. 2016). The Mariana-Izu Bonin forearc has been instrumental in the development of models linking geochemical evolution of subduction-related magmas in a forearc position to subduction initiation (Stern and Bloomer, 1992; Dewey and Casey, 2011; Stern et al., 2012). U/Pb and 40Ar/39Ar ages of the oldest forearc lavas that are believed to have formed during subduction initiation are consistently 51-52 Ma (Ishizuka et al., 2011; Reagan et al., 2013; Arculus et al., 2015), which we adopt as age for the onset of subduction of the Izu-Bonin slab.